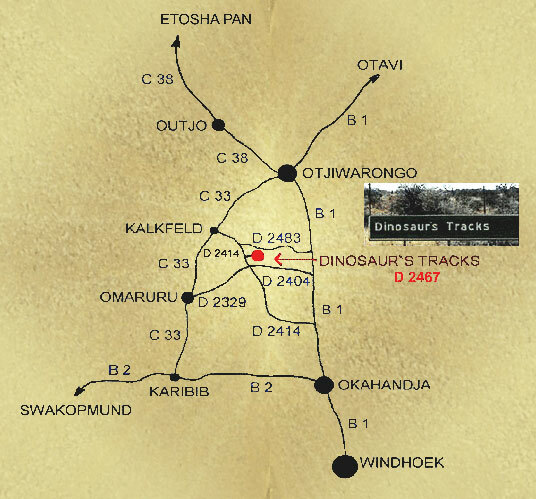 S 21° 02' 24" E 16° 24' 02"
you reach the street sign OKAHANDJA - DINOSAUR'S TRACKS 27 km. DINOSAUR'S TRACKS - Turn left into D 2467. - You pass through the farmgate and will reach our farm after another 1,5 km. * Attention: Do not follow the street sign given short before, saying “Dinosaur Campsite” and leading into D 2483. This street sign leads you to the Mount Etjo Safari Lodge but not to our farm. - After about 50 km turn right into the D 2414. Continue into direction Kalkfeld for approx. * Attention: When driving the D 2414 in direction Kalkfeld, do not follow the sign “Dinosaur Camp site” leading to D 2483. This would lead you to the Mount Etjo Safari Lodge, and not to our farm. We are looking forward to your visit and promise a wonderful and unforgettable stay. We wish you a pleasant journey.